Waterproof IP65 ,Main cable length 3 metres long power cord with good range flexibility, FDA approved Class II, class 2 laser. Environmental protection and energy conservation, No red, ultraviolet radiation that can protect eyes. Wireless Remote,adjust light direction and the speed as you want. 2 in 1 installation - Stick into the ground, using included screws to fix on the wall 2 modes - high light mode & dim light mode. 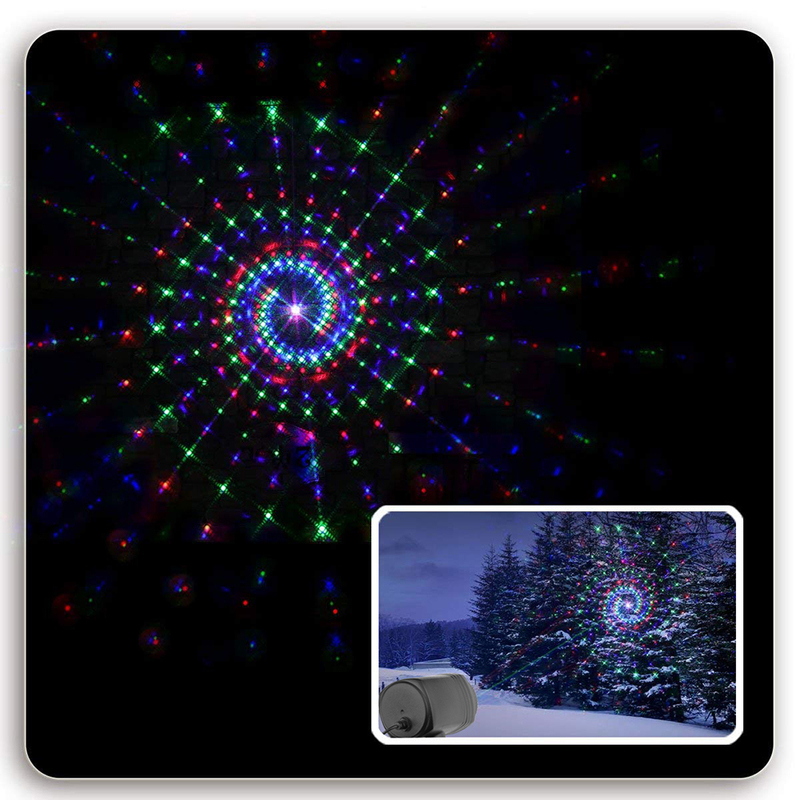 External Color:Black Light Color: Red + Green + Blue Laser effect:Moving 20 patterns red green blue laser show Bulb uses < 5mW and has a Class 3R Classification. Laser Source: DPSS Green Laser ,Red Laser Diode,Blue Laser Diode Laser Power: [email protected],[email protected],[email protected] Laser Classification:Class II Input: 100V~240V Waterproof Grade:IP65 Play Mode: AUTO (The points rotate clockwise or counterclockwise); Flash(speed adjustable). Operating temperature:-30℃ to 35℃ Mains cable length:3 metres Available plug: EU/US/AU/UK suit for you country Product Certification: CE, FDA,FCC,RoHS Note:In cold winter,please allow up to 5-10 minutes for light to warm up and reach its full projection Package Content: 1 x Dynamic Laser Light 1 x Remote Controller（Not inculde CR2025 button battery) 1 x Power Supply Adapter 1 x Ground Stake 1 x User Manual Notes: 1. Please go through all description before purchase 2. Keep away from children and NO direct eyes contact to the laser lights 3. The pictures will be little different in different monitor type or settings 4. We suggest run it 4 hours and then rest for 30 minutes in the summer and runs 6 hours then rest for 30 minutes in the winter for longer lifespan 5. Product Certification: Laser Lights certificated by FDA, FCC, ROSH and IP65 test.